Orphan Swords is a Brussels-based duo. Their critically-acclaimed music has been released on Idiosyncratics, Desire Records and Clan Destine. Yannick Franck and Pierre de Mûelenaere have collaborated with Ike Yard’s Stuart Argabright on several occasions, and have been remixed by Helm, Paul Purgas (Emptyset), Svengalisghost, Prostitutes, Dwellings (GNOD)… They’ve performed alongside Vatican Shadow, The Body, Black Rain, Extreme Precautions, Kyoka and more. Orphan Swords were nominated for SHAPE by Schiev Festival. Could you tell me about the genesis of Orphan Swords, and also the other activities that you are involved in? Pierre (de Mûelenaere) is in charge of Bozar Electronic Arts Festival in Brussels and I co-run an art centre in southern Belgium as well as the Idiosyncratics label. We’ve done other projects which were more art-related: mixed media and contemporary forms involving video art and other kinds of performances. Pierre had done his own music experiments, I have worked solo as an experimental musician/sound artist. One day he suggested that we do a more beat-oriented project. Pierre has a lot of energy and will and it was obvious there would be no slacking. The name came about literally out of the blue. I sent him an email with just “Orphan Swords” written in it, and he said “Yes, absolutely”. The brain creates free associations, and that sometimes leads to great art and interesting names. Could you talk about your musical background? I studied painting and became a sound artist at exactly the same time I learned to play the guitar. At some point I realised that sound was an excellent medium, so I switched from painting to sound. First my approach was abstract but then it became more and more musical. Pierre is a bookseller and publisher with a strong interest in music. 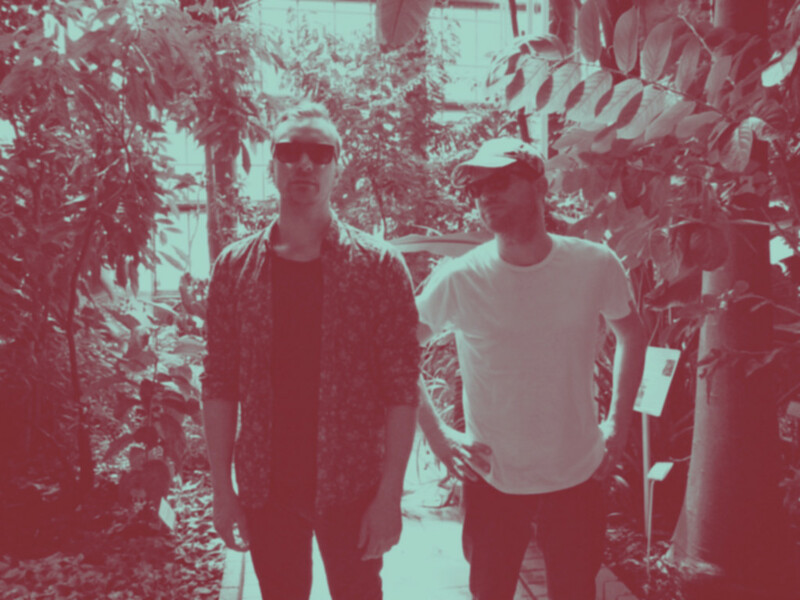 Orphan Swords represents something that he’s always wanted to achieve with a band – there’s a lot of interest comparatively to what we do and what we could expect with such radical music. We both do other things, but music is still an absolute priority. How does your involvement in all these extra-musical fields influence the music-making itself? At the art centre I work for it’s really important for me to interact with people who are aware – if not inspired – by other art and it’s the same with the band. What is important is to get to a point where one art influences the other and feeds off it. Pierre would be inspired by a book and talk to me about it and I’d react with a movie. Lately, we’ve been reading French para-surrealist writer René Daumal who founded the journal and literary movement, Le grand jeu. He used extremely free and creative writing techniques and was engaged in spiritual research. He’s also regarded as an early pataphysician. His novel, A Night Of Serious Drinking, stunned us with the originality of its writing and the clear-sightedness of its intuitions. I’d say we are even more inspired by these things than by music itself. I will have the weekend experience with Pierre on my mind and adapt a musical technique to something else at the art centre that I work for, and Pierre does the same. There’s a constant opportunity to improve things by crossing boundaries and limitations. I also wanted to discuss your sonic aesthetic. There are elements of industrial and techno in your music. First of all, both of our sensibilities collide in there. I’ve been very much involved in post-punk and industrial, sound research and experimental music. The label Idiosyncratics is oriented towards that. One of the most recent successes of our label is Charlemagne Palestine’s record, for instance. Pierre knows everything about contemporary music because he’s quite an important curator here in Belgium, so he has to stay in the loop, and I’m more aware of what’s been done in the past. We complete each other. Do you feel pressure from your knowledge of music and art history? You have collaborated with quite an impressive array of musicians. Can you talk about your favourite collaboration? Someone who absolutely became a partner in crime, a brother of sorts, is Stuart Argabright of Ike Yard. He’s extremely open-minded, but he knows what he wants, and everything is always possible. Creatively it’s like heaven. You meet up with Stuart, make music in a basement and certainly don’t feel like you’re with a more experienced musician who’s going to patronise you. We’ve been doing sessions together that might get released one day. I think it will be called “Black Swords”. Can you talk about your recent record, WEEHAWKEN? It brings together new productions with older tracks that we haven’t released on vinyl. It was released on Clan Destine, a record label from Glasgow. On a conceptual level, it’s inspired by the death of Alexander Hamilton, an important character in American history. I don’t want to talk too much about it, as it’s important not to say everything and leave space for free associations. In general, Orphan Swords is inspired by demonology and the world of finance, which actually rules the world. Finance is certainly more occult than any occultism has ever been. For instance, the title of our record, Risk In a New Age, was borrowed from the Bank of New York. “Risk in a new age” refers to investments in a new age – taking financial risks to invest. The album’s few lyrics and the tension between the song titles and the album name make sense in the end, even though in the process it’s highly intuitive. The album has lyrics that are “declinist” (like in fin-de-siècle literature). I’m pretty sure that our world as it is has come to an end. We can just prepare for what’s coming next. The signs are everywhere. It’s not completely pessimistic though, we are preparing for something else that’s coming, a different model. On the other hand, we like to keep this ambiguity of taking the bad side – taking the demonic names and titles from the world of finance – and not opposing it. I’ve been reading a book by Ursula K. Le Guin, a feminist Taoist science fiction writer, who said that to oppose something is to maintain it. We will never be in the role of political opposition. You don’t clearly state what you think about it, you just create something else with it which questions it. What do you think is the agency of underground music scenes these days? I like meta-politics, Gramsci’s idea that you can influence politics through culture. Any little change will eventually generate bigger changes. We don’t have any illusions about the impact, especially philosophical. People listen to music, but their choice of music already means a lot. If this message can spark new ideas, they might spread and mutate. It’s interesting to operate on a micro-scale, but with strong faith in commitment. It doesn’t matter if one or 2,000 people will be influenced. You play your role in some way, with your tools. Underground scenes are certainly more ethical than the world they exist in. It really depends on how you define optimistic. I think the world as it is is going to collapse, but it’s not necessarily apocalyptic in the dark sense of the word. If you go back to the first idea of the apocalypse, it’s just a radical change, and seeing it that way it’s optimistic. The world as it is doesn’t work really. But it’s an end of an era, and that always comes with some kind of decay and extremes, what the ancient Greeks called hubris, an excess in all ways. Music can be a catalyst for new ideas and forms of intellectual resistance.